Techne offers the fastest and lowest cost plastic extrusion cleaning systems on the market. The company's Industrial Fluidised Baths (IFB) remove almost all polymers and hydrocarbon-based products from tooling, components and parts. Cleaning time is dramatically faster than with oven methods, while the risk of tool damage and metal fatigue is greatly reduced. All seven Techne IFB models contain a bath of tiny, loosely packed aluminium oxide particles. When heated to high temperature (up to 600°C) and fluidised with a stream of compressed air or inert gas, these quickly degrade plastics to carbon, which then leaves the bath as CO2. Heaters on the outside wall of the bath radiate heat into the inner container of aluminium oxide. Fluidisation acts as the stirring mechanism, distributing heat throughout the bath resulting in very high thermal stability and uniformity. For manufacturers of plastic extrusions - tubes, pipes, rods, sheets, films, fibres, electrical cables and wires - cleaning plastic residues from tooling is typically a difficult and labour-intensive process. Use of scrapers, brushes or blow torches risks causing damage to expensive tooling. 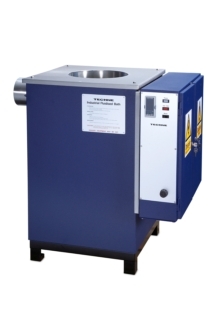 However, with typical cleaning times of as little as 20-30 minutes, Techne Industrial Fluidised Baths provide a fast alternative to oil, salt, ultrasonic and molten metal baths, ovens and furnaces with processing times of 4 to 8 hours. Additionally, IFB methods are safe, non-abrasive and environmentally friendly. Techne Industrial Fluidised Baths vary in capacity from 5 to 64 litres. In addition to cleaning applications, their excellent thermal performance makes them ideal for tempering, shape setting, annealing, Nitriding, distillation, curing, and thermal analysis of devices, components and materials. Designed for maximum cost-effectiveness, Techne IFB systems are modular. If required by customers, Techne also supplies an Afterburner to reduce smoke emission from the exhaust flue, a Fume Scrubber for removal of hydrogen chloride from exhaust gases, and a Cyclone to collect for recycling any aluminium oxide carried over into the IFB exhaust system.